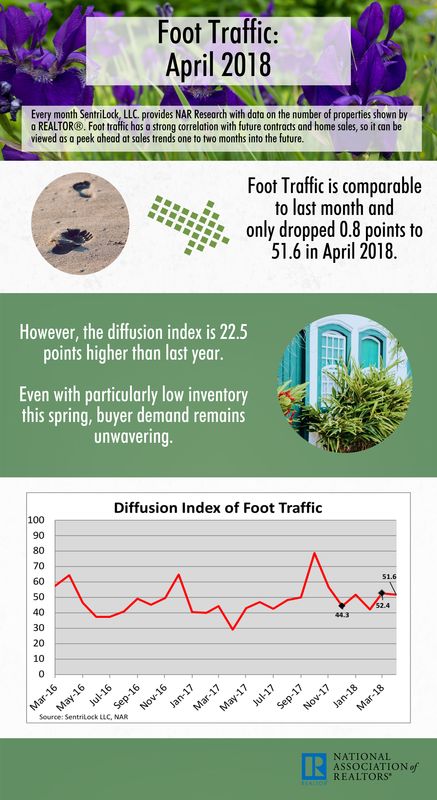 Foot Traffic is comparable to last month and only dropped 0.8 points to 51.6 in April 2018. Every month SentriLock, LLC. provides NAR Research with data on the number of properties shown by a REALTOR®. Lockboxes made by SentriLock, LLC. are used in roughly a third of home showings across the nation. Foot traffic has a strong correlation with future contracts and home sales, so it can be viewed as a peek ahead at sales trends two to three months into the future. This infographic shows the latest index data along with trends and changes.